Amazon has taken its popular voice-controlled Echo speaker and decapitated it. The squat new Echo Dot lost a built-in music speaker, but added the ability to commandeer your existing sound system. Amazon's Echo is a speaker crossed with a Siri-like voice assistant named Alexa who's always listening, waiting for your spoken commands. Since being released in late 2014, it's gone from an oddball gadget with a niche audience to a surprisingly powerful home control-center that anyone can enjoy. Still matte back and cylindrical with a blue ring of light, the 1.5-inch high Echo Dot doesn't make any design innovations. The main speaker is gone, but so is half the price tag. The Dot costs $89, while the Echo is $179. 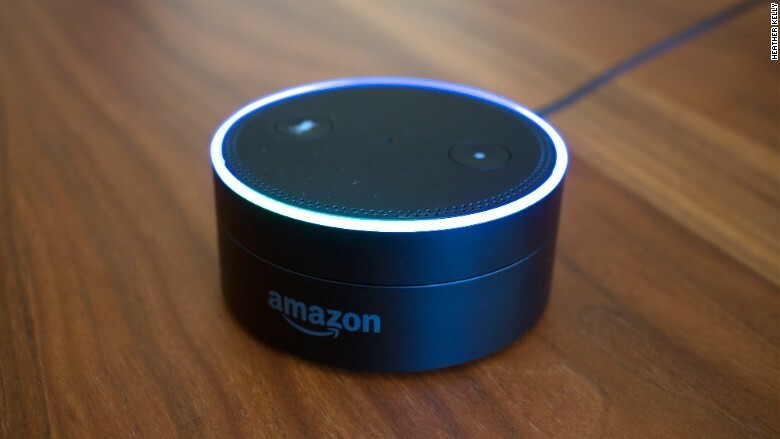 The Dot still includes a small speaker for the usual Alexa communication, although it isn't meant for music -- it's on par with a smartphone on full blast. But it includes a sweet new trick that makes up for the speaker downgrade: The Dot can connect with third-party speakers over Bluetooth or the included AUX cable. That means you can turn your existing home audio system into an Alexa speaker. Unfortunately, connecting the Dot to powerful speakers means it's harder for Alexa to hear you when music is playing. Instead of saying "Alexa" and speaking a command with your inside voice, you might need to shout "ALEXA!" a few times, then wait a moment until the music is automatically lowered. If you have a Sonos speaker with an AUX connection, you can turn it into a Alexa speaker. However, Sonos still hasn't added support for Alexa voice commands, a drag for anyone who already has a Sonos system setup. In side-by-side testing with the Echo, the Dot's microphones performed almost exactly the same when not connected to an external speaker, picking up soft-spoken "Alexa"s from a room away. There's no way to sync two Alexa devices. So if an Echo and and Echo Dot can both hear you, you'll be treated to a cacophony of weather reports. The soul of the Echo, Alexa, remains unchanged in the Dot. You still can ask it to play music on third-party services like Spotify and Pandora, tell it to turn down a Nest thermostat, set alarms, or order an Uber, all without touching it. In short, the Dot is ideal for anyone who wanted to try out the Echo but didn't need yet another speaker in their home.